Affectionately referred to by some as Gator bucks... These are a great way to show you care about your favorite angler. They are good for any aspect of Gates. If you don't see the amount you are after, give us a call 989-348-8462! Not sure what to buy your favorite anglers? Let them pick what they want. 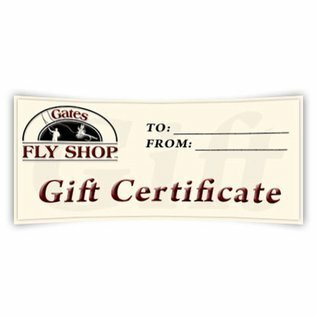 Gift Certificates are available in set amounts of $25, $50, $75, $100, $200, $300, $400, $500 online. They do not expire and can be used for many different things at Gates Lodge... restaurant, guides, rooms, flies and tackle. We can also custom fit a gift certificate to your particular vision (example: 2 nights lodging, $50 in the restaurant, and a full day guide trip). Just give us a call at the shop if you don't see the amount you want or to get prices for particular items.